The OT E252 continues a tradition of cheap Alcatel models. Its number really confuses, and you might think we are speaking about a relatively expensive phone. 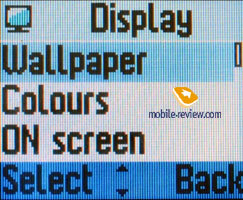 Also an unusual for the segment lacquered plastic tells in favour of this idea (not only the front panel, but the back one as well), however, the key block design, and the screen size point a budgetary category. External elements resemble the Е157, and indeed there is much in common between these devices. The differences in design: the E252 is more rectangular, and the designers tried to add some style to the model by a stylish loudspeaker grid, and the screen edging. 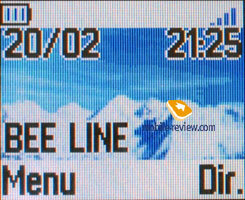 The display is STN, shows 4096 colours and has the resolution of 102x80 pixels, which allows up to 4 text lines and one service line. 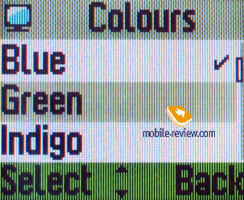 This screen is quite acceptable in the low-end segment, as here the sales of the first generation displays are still high (for instance, Motorola C350 with a similar display). 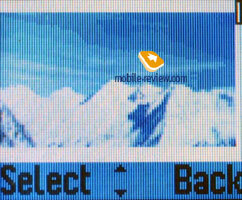 In the sun, the screen fades, however, it remains readable due to the big font-size. 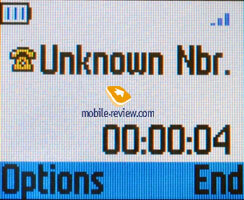 The phone size forms 97x43x19 mm, while it weighs 80 grams. 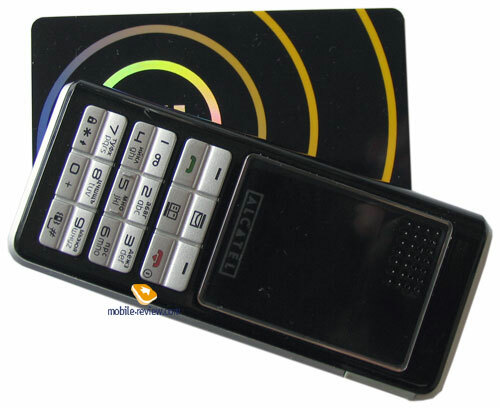 Carrying the handset is possible in any way you like, no problems appear. A strap hole is placed on the top of the body, and only a microphone gap is on the bottom. 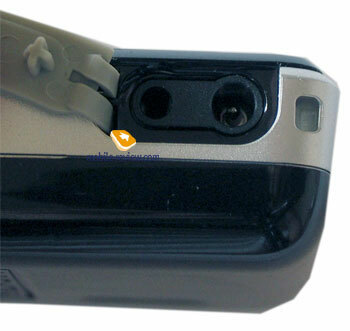 A charger and headset connectors are placed on the right side surface. 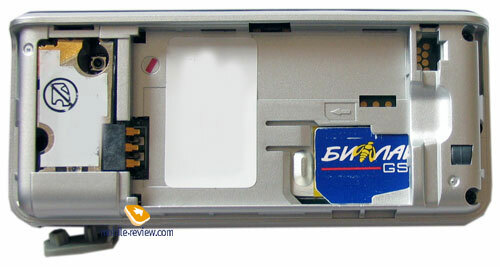 A rubber shutter closing the slots can dash out from the groove if using the device for long. The left side surface is free of elements. 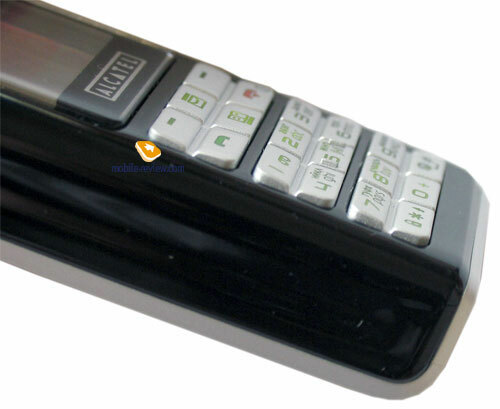 The keypad is rubber and divided into blocks containing two buttons each, which are separated with a little hollow. 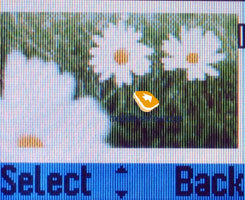 Such a solution to separate pairs of buttons looks interesting from the esthetic point of view, however it makes certain problems when using the phone - the buttons are small, so accidental pressures are often possible. However, that is mainly concerned with men having large arms, since women and children feel no discomfort working with the keypad. 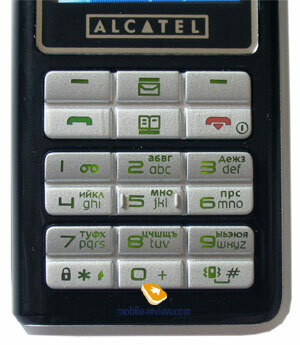 Besides Latin characters Cyrillic ones are present on the number keypad. The backlighting is even and green; all the characters are easy to read. The back cover is slid not in vertical line but in horizontal. This unusual solution is quite logical for it saves the cover from the vertical backlash. 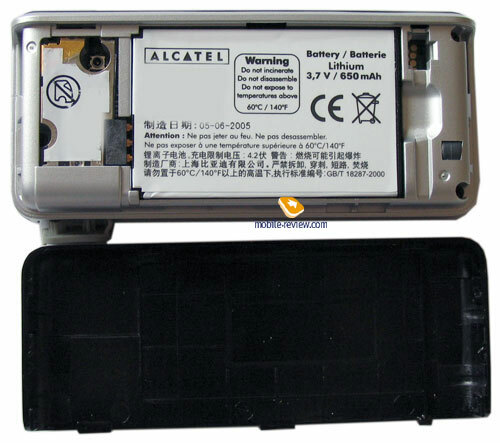 A 650 mAh Li-Ion battery is integrated into the phone, in Moscow the battery fully charged lasted for averagely 4 days in case of 20 minutes of talks and up to 20 minutes of other functions a day. Full recharging takes about 2 hours. 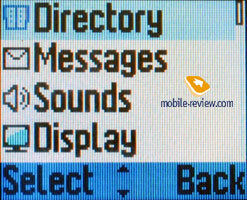 The main menu of the phone is represented as a vertical list, and each item is a small icon with a tip. 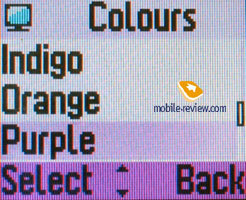 At the same time four items are seen in the main menu, and submenus are also represented as vertical lists. And only three subitems are seen since the top line is taken with a section name. 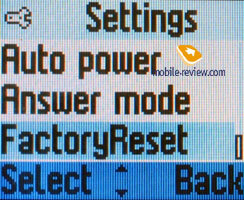 Pressing the left functional key in standby mode you enter the main menu. 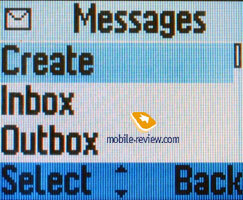 Pressing up or down in standby mode allows accessing messages and phonebook correspondingly. 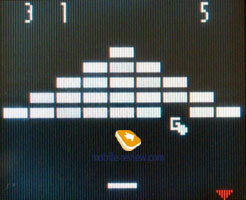 The localization is carried out at a good level, abbreviations happen, however, they are forced doe to the small screen. The only unpleasant moment is Russian fonts are thinner than English, and due to this information is readable worse. Russian and English T9 dictionaries are present, which allows adding own words to your liking. Phonebook. 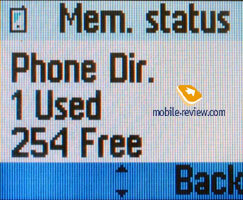 Up to 255 numbers can be kept in the phone's memory. 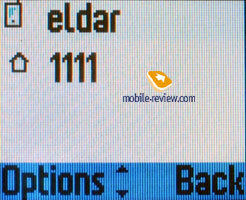 Each contact allows keeping only one phone number. 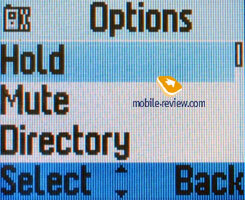 Search in the phonebook is carried out by the number or the group. 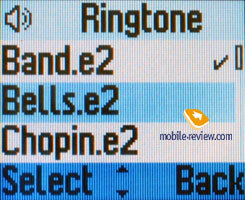 There are six groups completely adjustable by a user, personal name, call melody and SMS alert can be bound to a group. 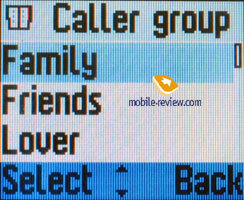 Phonebook contacts can be shown altogether (both from the phoneme memory and SIM-card) or separately. 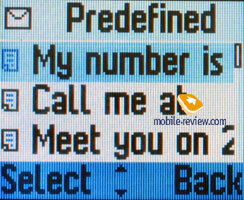 The phonebook has very little capabilities, however, it will be enough for users with a little contact base. The only thing that disappointed was there is no search by name; you'll have to flick through all contacts one after one. And if there are more than 50 contacts, that will be problematic. Messages. 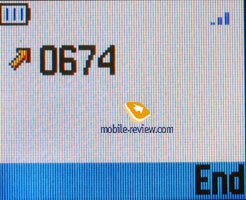 No EMS support is provided, and all your SMS will be stored in the SIM-card memory. 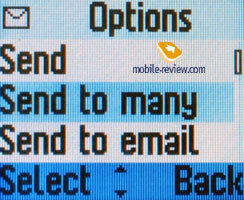 Positive features are a capability to send a group message, even sending a text message to e-mail (if your operator supports the function). Besides, there are 8 text templates, which can be changed to your liking. Melodies. Here you can select the type of alert. That may be a melody, vibracall, vibra plus sound, vibra then sound, vibra - signal - melody, and silent mode. 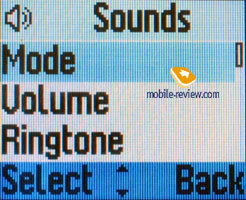 Call volume is set from here also (5 levels), as well as call melody for an incoming call, SMS and choose sounds for other actions. Settings. 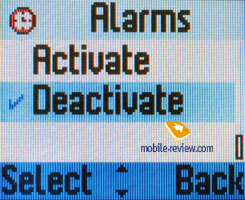 Here you can set date and time, select language, set the time for automatic phone on/off. 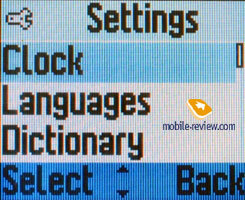 Also here is a T9 dictionary, which you can supply with own words. Call service. All the network settings are here. Games. 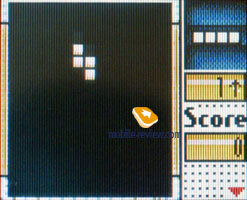 There are two games, the one called Russia (famous Tetris) and Bricks (as famous archanoid). Tools. 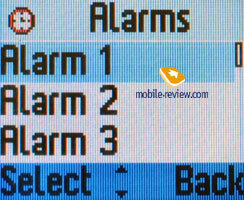 Four alarm clocks are provided and only time can be set for each. Alarm clocks work with the phone off. 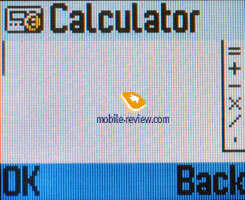 A plain calculator is also here besides alarm clocks. 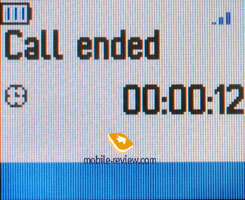 We have a little complain of the connection quality, in low coverage zones, when only one-two points were on the screen; the phone was unavailable to call. In good coverage zones the device behaved well. 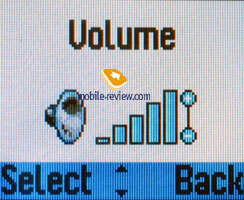 The loudspeaker volume is average and in a very noisy street you'll hardly hear your interlocutor. The polyphony is 16-tones, however the sound quality resembles 4-tones one. The power of a vibracall is low, and can be missed sometimes. 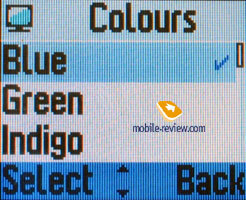 This phone is a complete copy of Alcatel OT E157 with only one difference: a usual screen is integrated instead of a pseudocolour, just a plain colour screen. 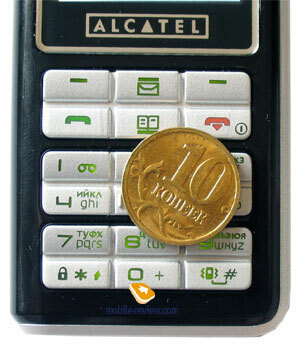 At the price 10 USD higher than the Е157, which is about 65-70 USD, Alcatel OT E252 is a typical low-end phone. We can see no peculiar advantages, except for the appearance, maybe. 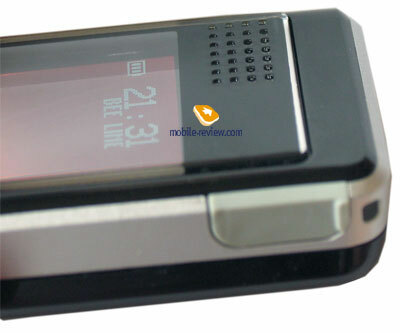 All the other characteristics are not as outstanding - that is a cheap phone which is to attract with the price. It would be great as the first device for young schoolchildren, couriers and drivers.